The travels and adventures of a couple of nuts wandering around New Jersey, looking for history, birds and other stuff. Sometimes Hidden New Jersey spots jump out at us serendipitously, a phenomenon which seems to happen more often out of state. 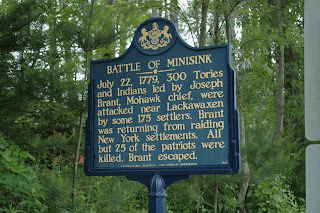 That was the case on an unplanned recent visit to the Upper Delaware River in New York State. First, though, a little background, starting when I was writing the blog entry on Trenton's Riverview Cemetery. In researching the Roebling family members whose graves we visited, I discovered that one of John Roebling's early spans was an aqueduct crossing the Delaware between New York and Pennsylvania. I didn't read much about it, but the photo looked cool, and I told Ivan we should visit. Not surprisingly (because we'd already grown accustomed to such coincidences), he'd already come upon it in his travels. 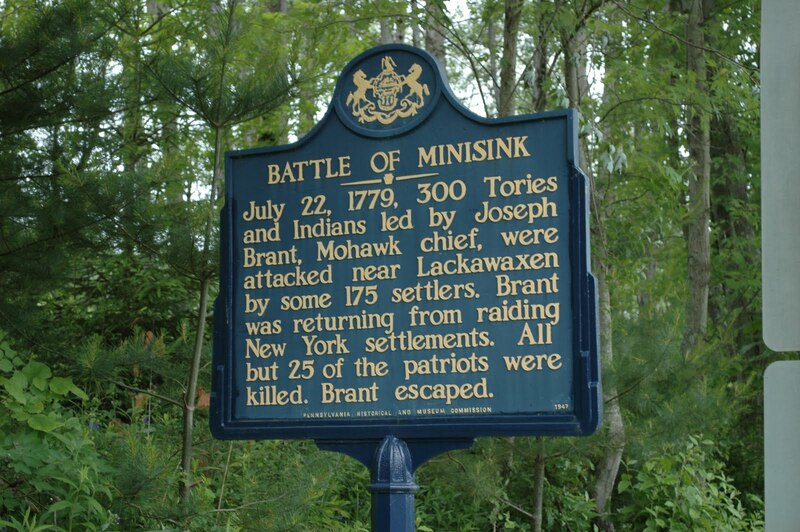 In fact, he'd discovered it after having his own bit of serendipity: the nearby Minisink Ford hosted a battleground where a commissioned Mohawk named Joseph Brant had led British troops against local colonists in 1779. Ivan had seen the name at another distant stop on his trip, no doubt remembering the name because it's, well, a species of goose. Making stops in two obscure places and seeing the same name? What are the chances? I'd totally forgotten about the bridge when we got to the area, and thought it would be fun to check out the battlefield, which we did. Taking another road from the site than the one we used to get there, we found ourselves squarely across from the Roebling bridge. This was too good to be true! We had to stop. What's now a one-lane river crossing was once an active aqueduct for the Delaware and Hudson Canal. Current day pedestrian walkways were once tow paths for the mules who pulled barges along the waterway, making for an interesting stroll across the broad river. It's kind of funny to think of there being a water bridge across a body of water, but when you look at the history, it makes sense. 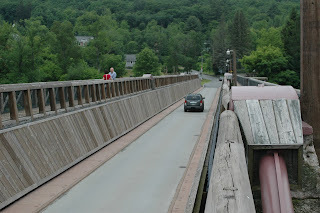 The canal had to cross the New York/Pennsylvania border, and originally the barges would traverse the river to get to the dug canal on the other side. Problem was, loggers upstream would use the river to transport wood downstream, making collisions almost inevitable. Someone had to yield, and it ended up being the canal traffic. Enter John Roebling, engineer and wire cable manufacturer. From 1847 to 1851, long before becoming famous for building the Brooklyn Bridge, he built four suspension aqueducts along the canal. The one we visited was the last remaining, and also the oldest wire cable bridge in the United States. He did good work, too. According to the NPS website, nearly all of the bridge's ironwork, from cables to suspenders, are the same materials installed upon the structure's construction. The cables - spun on site under Roebling's direction - were tested in 1983 and found to be still viable. Now, that's craftsmanship! 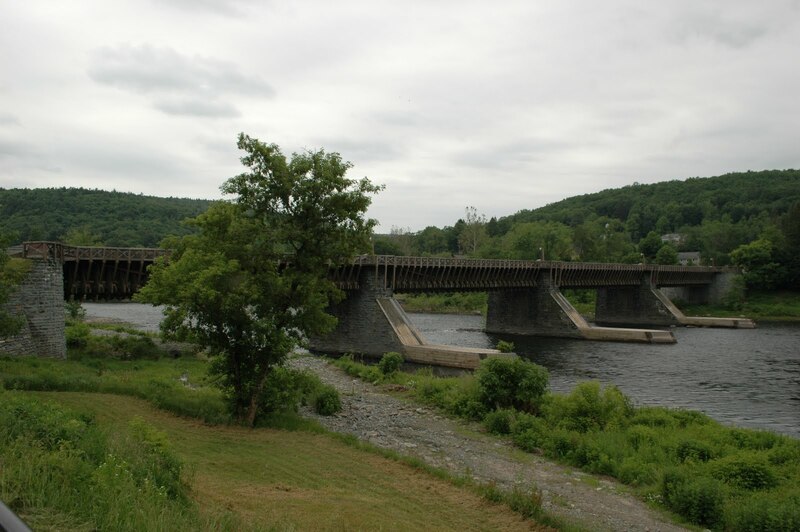 For a time after the D&H was abandoned, the bridge operated as a private toll road, serving in that capacity until 1979. After many years of disrepair, the National Park Service bought and restored the aqueduct and toll house in 1986. 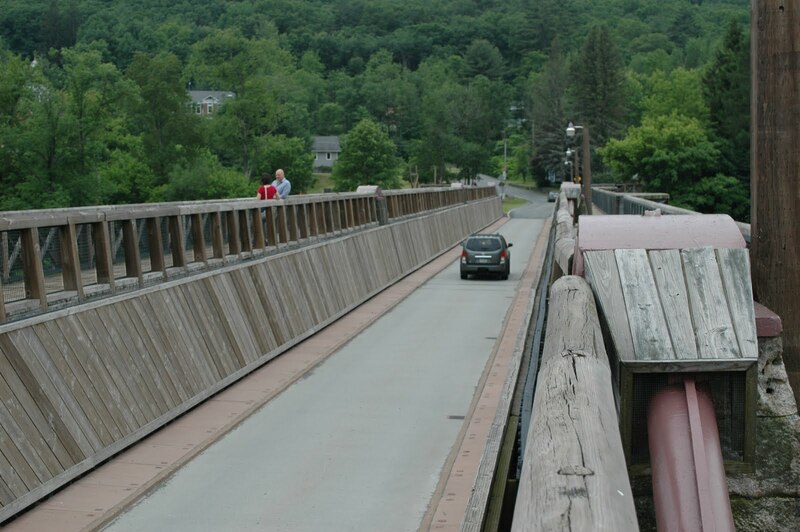 Visitors can enjoy a few interpretive exhibits in the New York-side house, and even drive across the bridge's active roadway. We decided it would be more fun to stroll the towpath from New York to Pennsy and back again, taking the chance to do a spot of birding. While it was an overcast day, the scenery was beautiful, and we even saw a young bald eagle in the distant sky. Having found New Jersey striding across the far reaches of the Delaware, I can't help but realize that the water that flowed under the bridge deck beneath our feet eventually glided past Roebling's grave in Riverside Cemetery in Trenton. Hopefully he's resting well, knowing that his works continue to serve the traveling public, over 150 years later. Want fries with that treaty? World War I ends in Somerville. Do you know a historic, interesting or just plain fun place in New Jersey that we should visit? Send your suggestions to hiddennj@gmail.com, and we may just check it out! Where is the Line Between North & South Jersey? Visit Hidden's profile on Pinterest. Copyright 2011-2018 by Susan Kaufmann. All rights reserved. Travel theme. Powered by Blogger.